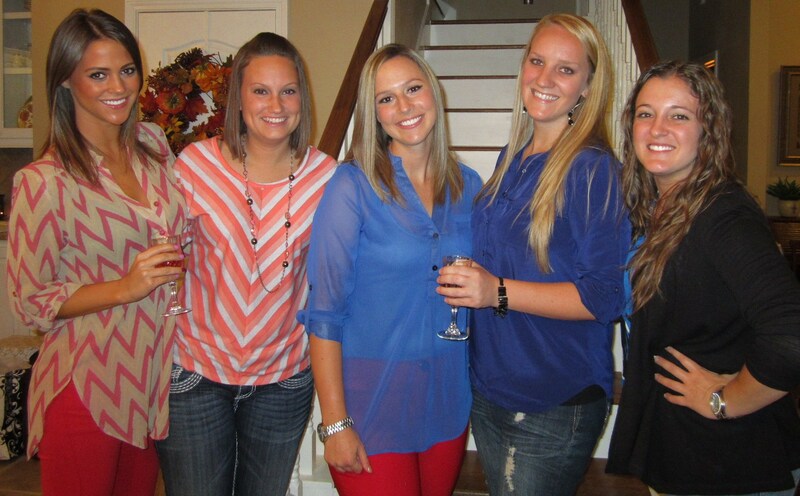 Holli’s Bridal Shower | Sweet . Sassy . and a bit Smart-Assy . This weekend was a busy one for me! But it was definitely fun! I kicked off the weekend with Holli’s bridal shower. Holli is a friend from HS (really more like elementary school) who is getting married in January. So excited for you, Holli! Congrats! Holli’s shower started around 7 so Mom and I decided to grab dinner with Jessica and her mom, Nic. We weren’t sure if they were going to have food at the shower but we figured there would be finger foods or something so we all split meals or ate appetizers and had margaritas. And it was a good thing we didn’t get full because when we got to Holli’s house, they had Olive Garden! Lasagna, salad, and breadsticks…not to mention some pretty addicting truffles, which were similar to Mom’s cakeballs but a little smaller. I was excited for Holli’s shower because I was able to catch up with some friends that I hadn’t gotten to see in a while. We drank wine, ate dinner, and chit-chatted for a while before Holli opened her gifts. We played a fun game where Holli’s Maid of Honor asked her fiance 10 questions. Everyone at the shower was given a piece of paper and we had to write how many questions we thought Holli would get right about her fiance. I thought she would get 6 correct. Holli’s MOH asked him questions about his favorite color, least favorite food, favorite song, and to just pick a number 1 through 10. We all had to guess what his answers would be and I got 3 correct, even though I have never met him before…pure luck. After we all answered what we thought he would say, they tallied up Holli’s points…she didn’t get any right but to be fair to her, she knew some of the answers before they said them out loud but she had written down something different. Also, how would you just guess a number anyone picks between 1 and 10?!? haha I think everyone had a good time with that game. 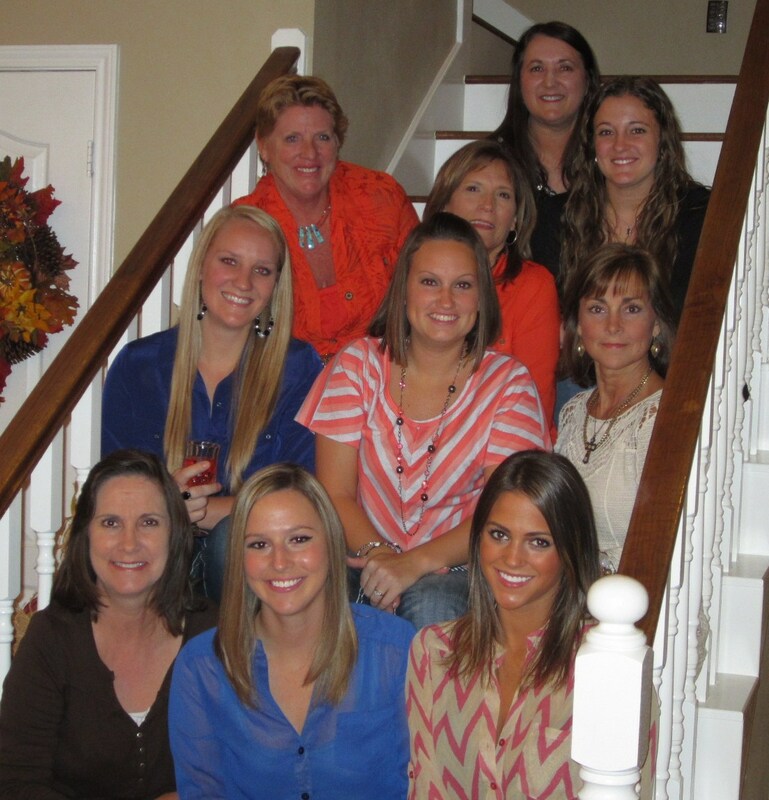 Because the five of us (pictured above) grew up together, all of our moms became friends too. So they were all there with us. Personally I think it is a little frightening how much we all look like our moms…don’t you think? I would point out who belongs to who but it seems fairly obvious. If you don’t know any of these girls or their moms, you can have a fun guessing game with yourself and send me your guesses and I can let you know if you were right…odds are you will be though. Unfortunately I had to leave early because I was headed to College Station with a group of friends picking me up at 9. I was sad to leave early, especially before I even got to see Holli open her gifts, but I was happy that I was able to go for a little while and visit with everyone! Congrats again, Holli! I can’t wait for your big day in January!! You are going to make a GORGEOUS bride! Hi Blair! It’s Neva’s Mom, Diane. I just love your blog!! Keep it up. Neva and I are both going to be out of town to visit family in New York next month and we will miss Bunco. Do you think you and your Mom can sub for us? It’s November 12th.